How to organise your Marine first aid kits to suit you and your family’s boating needs. This article is deliberately titled 'Marine First Aid Kits', in the plural. Now don't get me wrong, I'm not suggestion that you carry enough kit to stock a hospital. What I'm suggesting is that you separate your onboard medical supplies into smaller, easily identified categories that can be accessed quickly. There are numerous pre-packaged kits available commercially, which have been put together with expert medical knowledge, they are worth investing in. These will often contain just about everything you will ever need. However, if you are like me, most of the time the first aid required is simply a sticky band aid to stop the bleeding from a minor cut. This is not the time to be rummaging among all those bandages, eye wash, field dressings etc. So the first line of defense should be a waterproof, easy to open container with the basics for treating those every day scrapes and cuts. And this is equally important in the workshop. Of course no kit is of any use if you have left it at home or forgotten to restock it, put it on your logbook check list. 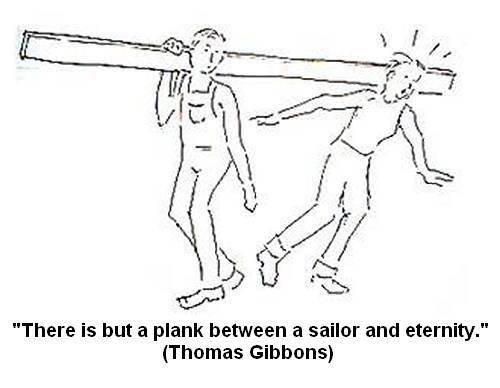 And add to your passage plan the specific medical needs of any of your crew members. For when you don't have time to open the first aid box. Prevention is better than any cure, so keep a tube of antibiotic ointment out and handy, next to the sink or wash hand basin. Then when you wash your hands, you can dab a bit on any cuts and scrapes to prevent them becoming infected. And don't forget that fix-all, good ol' duct tape. Most boaters have at least one roll handy, it's easy to rip off a strip to staunch the blood until you can get to the first aid kit and deal with the cut properly, better than getting blood on that nice new sail. And it will stick better than proper band-aids on wet hands. This basic first aid kit is one you can make up yourself without much in the way of medical knowledge. It is not really an emergency kit, just an everyday minor patch up kit, which will be quick and easy to grab and clearly ladled as such. It should contain just a few items. The main one being those band aids, personally I prefer the type that comes in a strip so I can cut off as much or as little as is needed. So, you'll need a pair of small scissors, a pair which must always be put back for the next time. Antibiotic Ointment, event the most minor cuts and scrapes can become infected. Hand sanitizer or wipes to clean both the wound area and the hands of the first aider. And some disposable Latex Gloves for the first aider. A pair of Tweezersfor removing splinters, thorns, sea urchin spines, etc. You may also want to add some Gauze Rolland small Gauze Pads. And a small Portable Flashlight just in case the light is bad. This will be the most used marine first aid kit on board, especially if you have a family of normal health kids but then if you have children you have probably already been there and done it. As I have already said the pre-packed kits you can buy will contain all you need for most situations. However for anyone with any medical problems or anyone who requires specific medication it is a good idea to have a separate clearly labeled container for their own needs. How much to carry will obviously depend on how long you intend to be away from civilization or a source of resupply. The ideal would be a smaller marine first aid kit containing what you require for the duration of the trip plus a bit extra just in case. Take with you a copy of your medication prescriptions, this will help make sure that if you should need extra supplies that you get the correct substance. 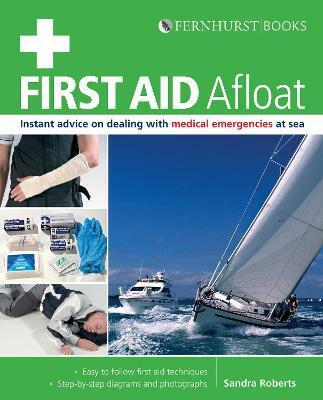 Marine First Aid for Local Boating. I hope I'm not giving the impression that you should carry vast amounts of marine first aid kits for every eventuality. For the average boater with little medical knowledge there is no point carrying anything complicated, even with medical knowledge real emergencies will usually require outside assistance. This is especially true when boating in home waters where nearby friends or family can summon assistance within minutes or emergency rescue services can be called by radio or even phone. It is a good idea to carry a marine first aid medical emergency reference book on board, as much for the first aider's reassurance as for the patient. The vast majority of boating trips pass off without anything remotely approaching an emergency. However, it is not uncommon for a trip to be ruined because one or other crew member is suffering from something minor such as bug bites, sun burn, or diarrhoea. The idea of the 'local kit' is to carry enough to treat those common on board health problems as well as some extra Gauze Roll, Gauze Pads, band aids, a few safety pins and another small pair of scissors. Now I am neither a pharmacist nor medical doctor so I have no intention of recommending products, besides everyone has their own favourites. All I can suggest is that you carry some off the shelf products of the kind which are unlikely to produce side effects. Some pain killers, some of which also and reduce fever and an anti-inflammatory product. Perhaps an antihistamine for allergies. Sun screen, it is surprising how easily it is to get badly burnt while out on the water. Some more antiseptic wipes and hand cleaner. A thermometeror one of those temperature strips will help determine if it really is a fever and how bad. Butterfly bandages for closing a deep cut without stitches. They look like bow ties, sticky tabs with a narrow middle available at any pharmacy. Or you can make your own from a strip of first aid tape (or good 'ol duct tape). Simply cut a notch from either side of the middle of the strip and then twist it a few times so that there is a narrow, twisted bit in the middle. Hopefully, you'll never have to open this marine first aid kit but the point is to deal with the non-emergency problems that don't require immediate medical assistance. Many of these minor problems can spoil a trip yet are relatively easy to deal with using everyday medicines, but only if you have them with you. “She found out that having something to do prevented you from feeling seasick, and that even a job like scrubbing a deck could be satisfying, if it was done in a seamanlike way. She was very taken with this notion, and later on she folded the blankets on her bunk in a seamanlike way, and put her possessions in the closet in a seamanlike way, and used 'stow' instead of 'tidy' for the process of doing so. If you are intending to travel to 'exotic' destinations it is worth finding out all you can about local medical facilities before you start stocking up with a trunk full of equipment. There are many cruising destinations, where until only a few years ago medical facilities ranged between non-existent and primitive but which have now improved enormously, though it might be advisable say, to take your own hypodermic needles. Check out all the most up to date cruising blogs for first hand information and of course your own national tourist information bureaus. For the long distance cruiser today, the main time for concern is when in mid ocean. This is where your best marine first aid kit could be your long range communication equipment. Advances in satellite communications means that someone with an emergency situation in mid ocean can talk to their own doctor thousands of miles away and receive immediate advice on how to treat or at least stabilize the condition. And in coastal waters VHF will connect you to coast guard emergency services. But even so it is worth acquiring some basic medical knowledge before setting off, as well as carrying a comprehensive first aid manual. While the basic marine first aid kits will cover everyday events, harsher climates and out of the way places may require supplementary supplies. There a number of retailers selling boating medical kit that contain most of what you might need. However, check with your physician if you have specific requirements and with some planning put together a marine first aid kit specific to your own requirements and capabilities. Match the marine first aid kit with your own medical knowledge as well as the size of your boat, the health of your crew, the areas where you are sailing and your pocket. Unless you are prepared to spend many years at medical school your marine first aid should be just that until you can get outside qualified assistance. And of course you will need a kit to go with your grab bag. While this will need to cover basic first aid it will also need to address other more extreme considerations.